I've had the pleasure of meeting Mrs. Demaz Baker, a local chef and author of A taste of Cambodian Cuisine . This book is full of traditional recipes using ingredients that can be easily found at local Asian markets. I've tried a few of the recipes and they all bring back flavors and dishes from my childhood. 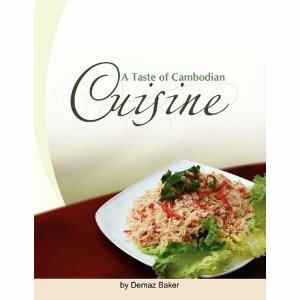 One of my favorite recipes from this book is Amok, a Cambodian national dish of Steamed Fish Stew. I made it for my parents and they loved it! The fish marinade is made with thinly sliced fish in coconut milk, curry paste, fish sauce and kaifir lime leaves. You can get the full recipe by purchasing her book. For more information, please visit her site. WOW! I am super impressed! This looks amazing! I love this! It's so good in Cambodia! I NEED to make this. I didn't know there was a curry paste in Asian markets. I need that.